← Paul Krugman Is Right! This new article from the St Louis Fed – A History of FOMC Dissents – is an interesting document. We learn, for example, that Richmond Fed president Jeffrey Lacker is “bronze medal” for the number of dissents (13) in Fed history. What I find interesting is the chart that gives the number of dissents by year from 1957 to 2013. 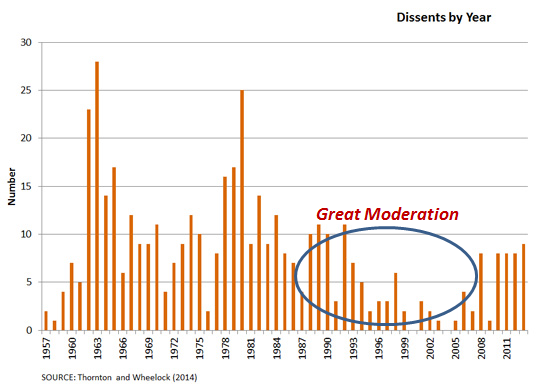 Note how the “Great Moderation” was successful in bringing down and keeping low the number of dissents. The authors show that there is a positive association between the number of dissents and unemployment and inflation. By managing to obtain nominal stability at an appropriate level of activity (not the ersatz nominal stability of today) monetary policy was all important in keeping unemployment, inflation and dissents contained.